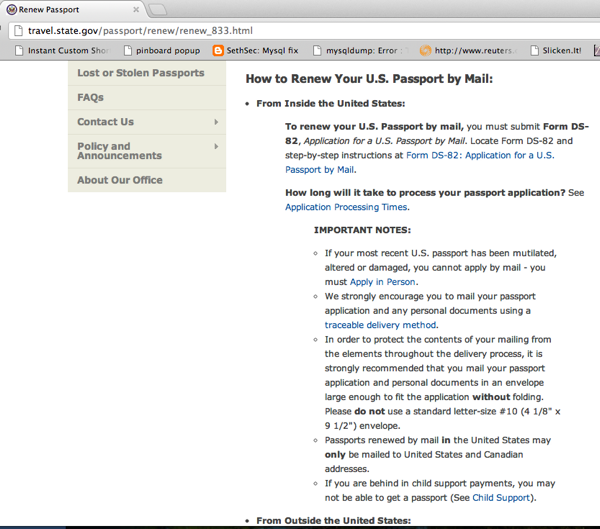 It might be easier than travel.state.gov thinks to go through a passport renewal. I burnt up four solid hours in travel time today for nothing. I’ve calmed down quite a bit, but am still smoldering a little. Hopefully someone else won’t have to waste any of their time on this topic. Or Madam Secretary will give me a shout out. That would make things a little better, too. 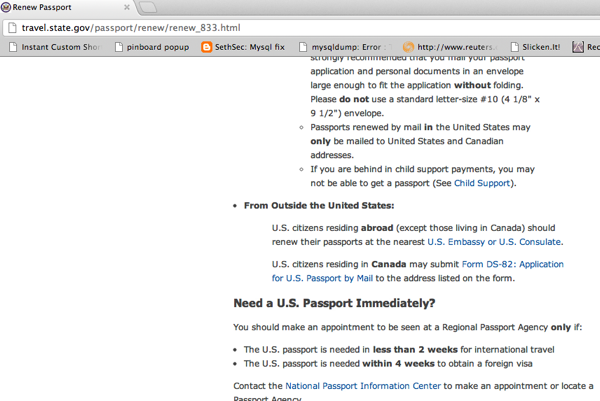 My passport expires in March 2013. Sarah and I have read that some countries do not allow U.S. citizens (or perhaps others) to enter if the holder’s passport has fewer than six months of validity remaining. 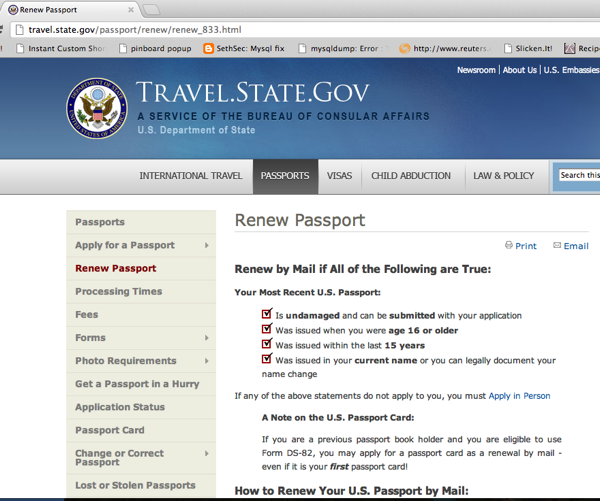 OK, so this is a good time of year to get my new passport renewal application rolling. But hold on there a minute. Let’s scroll down. Hmm. Super-good for those stateside. What about the rest of us? OK, darn, I guess I have to go to the nearest Embassy or Consulate. In Munich. Minimum two hours of travel one way means I have to take a day off of work. But you know what? It’s worth it to me, even though I can’t really afford the time away from work, to make sure that I can fly out on a trip somewhere (perhaps even an emergency business trip) without fearing I’ll forget about passport expiration closer to the expiration date. OK. So — I’m supposed to leave my stuff in a locked car (I don’t have a car). Or leave it at the train station, about a half-hour away from the consulate when traveling by public transit? 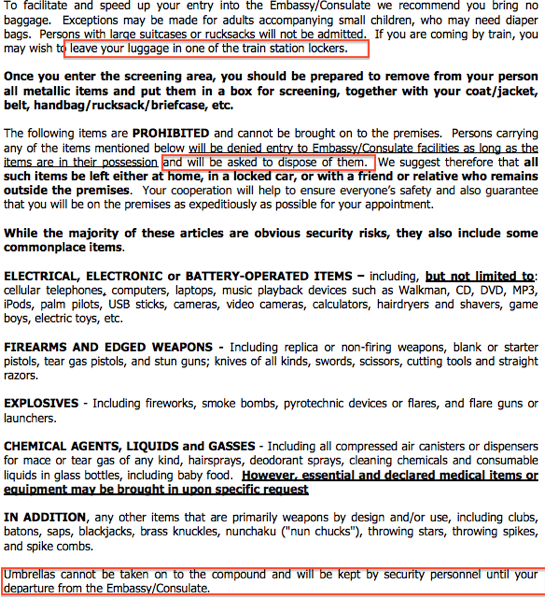 And if I try to bring my stuff with me anyways, they will ask me to THROW IT AWAY? Unless it’s an umbrella, which they are willing to babysit for me. Okay, fine. Sarah needed to visit Munich for her choir practice this evening anyways. She could hold onto my stuff while I was at the consulate. 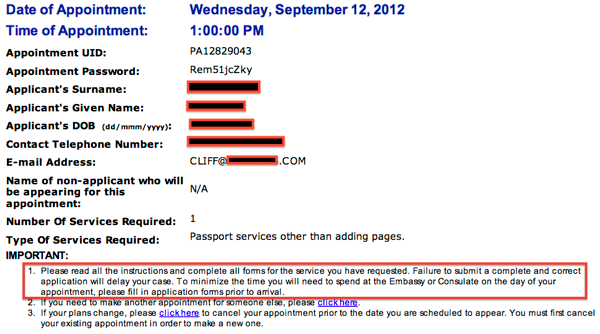 On that same page, there’s a link to their appointment page (they don’t take walk-in appointments anymore)2. I schedule an appointment and thought I was good-to-go. Huh? What forms? I’m just supposed to renew in person, right? So, I scrambled. I came up with Form DS-82 as my best guess for a passport renewal by mail, even though the websites I’d already seen said I’m not eligible for that. We hit a local passport photo booth on the way off our island towards Regensburg Hbf. We did the 1.5 hours to München Hbf, changed to the U4/5 Richtung Arabella Park and hoofed the last 10 minutes toward Königinstraße. I specifically wore my rainjacket with the brimmed hood to avoid the umbrella topic altogether. I dropped all my confiscatable stuff off with Sarah. Outside the consulate entrance there’s a bulletin board with a notice about passport renewal by mail. I asked the security guard if that was perhaps an obsolete notice someone forgot to take down. “Um, no, that’s still valid as far as I know, sir.” This was Bad Sign #1. I entered the security zone, and passed the check with flying colors (though the guards were bewildered that I had no car keys for them to confiscate. Hey guys, have you ever tried to park outside the consulate grounds?). Another gentleman was visiting the consulate at the same time as me, and going through the security check as well. How come they were all smiles about this other dude’s Samsung Galaxy and his umbrella? Should there not have been some drama about his Big Phone / Tiny Tablet landing in the garbage? This was Bad Sign #2. Okay, but why didn’t you do all this by mail? He came back about five seconds later all smiles. I guess my head is of adequate size. We’ll see in about two weeks. How in the HELL would I think of looking up usembassy.de when travel.state.gov refers me to the nearest embassy or consulate and does not ever hyperlink to that address!? Alert reader Jenna3 emailed us to remark that some of the links in this post pointing to the Munich Consulate are now broken. I thought that might be a good thing, like maybe the whole State Department has cleaned up their act. Here’re some fresh links — let’s hope they help someone. Also, Damon renewed his in person a year or two ago, too….and maybe didn’t have to? Argh. Looks like it, yeah. Frankfurt has their own rules about delivery of the documents, but mail-in renewal works there, too (I’m assuming he renewed in person in Frankfurt). You have to love working with the government. This is not the first time I, friends or co-workers have had problems with the State Dept. Good thing you a got a reasonable employee to work with. Oh yeah, there was nothing HE did wrong. Clearly not his fault that the State Department is publishing different versions of their rules on their own websites. Man. That is frustrating, Cliff! I’m sorry to hear you went through all that unnecessary trouble. I see you contacted travel.state.gov about it- hopefully your efforts will pay off and they will change their information! I realized a few things in a similar vein last weekend on my trip to the Berlin embassy. I was standing in line and a German woman, who had been told her bag was too big and had left the line to leave her stuff with a newspaper kiosk guy in exchange for a euro, told me I might have problems with my purse and didn’t I read the info on the website? I had forgotten the thing about how big purses are allowed to be, so I got a bit nervous until I realized that the other Americans in line also had bigger bags and they were getting through. So there seems to be a double standard in favor of American citizens. The lady behind me was also allowed to leave her cell phone in the locker there at the security desk, and my keys were deposited there too. Then when I submitted my documents inside, the guy at the desk was nice but surprised at how big my self-addressed envelope was (a4), even though it definitely said on the website that it’s best to have an envelope that fits all the papers without having to fold them. Strange, right? I guess I’m a little old-skool in that I phoned them when I went to renew mine in 2007 and was given the scoop as to what exactly was required. Still had problems, though. My wife came with me and had to stand outside the whole time because she wasn’t on the list (no guests allowed when you go in, really insulting). Another time when I was there, I was getting my daughter her passport and was asked if I wanted her SSN at the same time… Okay, sure, sounds like a good idea. Weeks later they sent me her passport and in the same envelope there was a letter that they could not issue her SSN because she didn’t have a valid passport…. Yes, in the same envelope as the newly issued passport. State is the most bureaucratic of the federal agencies (from what I have heard from old colleagues there). Someone probably submitted a memo to update the website 5 years ago, and has been bouncing around State waiting for someone to act on it sense then. Follow-up: at least it didn’t take long to be processed and delivered! I applied for the new passport on a Wednesday afternoon. Thursday morning of the next week, it arrived in the mail. That’s pretty nifty! 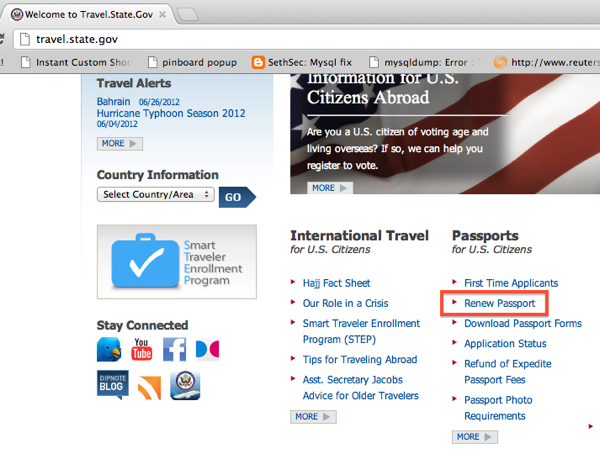 The travel.state.gov website is still out of date… What a joke! Thanks for checking in. I wonder if it’ll ever get an update!? July 11, 2015 – Just renewed my US Passport by mail via the US Consulate in Frankfurt – took exactly only TWO (2 !!!) weeks from day (June 24, 2015) of sending the DHL EXPRESSEASY envelope with the old passport to the day of receiving DHL EXPRESSEASY envelope with the new passport (and cancelled old passport) on July 9, 2015. The application Form DS-82 you fill out online and the Website prints the form as .pdf-file. The “Credit Card Payment Authorization Form” you get from the “germany.usembassy.gov”-Website. Getting the new Photo in required 5 x 5 cm format took 15 min. at a German Foto shop. The old Passport you have already. That’s it ! Hope yours goes so quickly, too ! particularly the post from “sr5dnptylno”. Glad it went well for you, Dr. Bob — thanks for posting! Note that the travel.state.gov site has an updated design, but the info on it is still incorrect/incomplete and misleading and potentially time-wasting for U.S. citizens in Germany. Update – Passport Card received in 6 weeks (August 4, 2015) after sending in application to the U.S. Consulate Frankfurt. The Passport Book I had received back renewed in just 2 (two !!) weeks. SO…what does this mean exactly?! I have a German account that can issue the funds in US currency, but funds would be pulled directly from my German account. Does this mean I cannot get a check from my German bank because it is not linked to a US bank account? I have DeutscheBank. If this is the case, what options do I have? I found the exact bit of language you quoted above on the U.S. Embassy site (http://germany.usembassy.gov/acs/passport_payment/), which took a fair bit of searching, is extremely confusing and, for many of us, NOT APPLICABLE. To do this by mail, if a credit card is not an option, I’m thinking AMEX money order is going to be your best bet; locate an AMEX travel agency and they should be able to do it or tell you who to contact. Before you do anything, I suggest making a list of the documents that you need as instructed by the website. Then, in a very clear and unmistakable e-mail (use bullet points, seriously), contact your local consulate and ask for an explicit confirmation that you can send this stuff and get a passport back. In our experiences with the Munich consulate, they reply to e-mails quickly and clearly. Although if you’re stuck with the Frankfurt consulate (I’ve heard horror stories), your mileage may vary. Good luck and please let us know if you find a better way forward. It still looks as confusing as ever. Thanks for the reply Sarah. I wanted to offer an update and some rather helpful info for those facing a renewal. I called the embassy hotline and spoke with a very nice woman that clarified everything. She was candid and put all my worries to rest. Firstly, she stated…”Your passport is only a document, it may expire, but YOU as a US citizen do not.” She said the consulates office has no concern regarding the date or how long ago it expired, their goal is to get a new passport to a remote citizen in the most timely manner possible. She stated they prioritize remote foreign documenting and the office in Frankfurt is the actual passport facility for the EU. The days they once forwarded everything stateside is long gone. She told me she was glad I came straight to the horses mouth for information because so many expats are avoiding the process if their documents have expired due to horror stories and scare tactics they read on the web. She sent a detailed instruction sheet to my email outlining each step. Payment: The U.S. currency bank check can be ordered from any EU bank. My bank in Germany charged 18 euro and it took ten days to receive by mail. (Be sure when you fill out the request form with the bank, you print neatly and double check the spelling and such. However you write it is how they will print it and if a mistake is made, you will need to order it again). If you do not have a bank it is possible to order this from a currency exchange place for about 24 euro. Photos: DO NOT USE PHOTO BOOTH that claims it is passport approved. Go to a photo store and ask if they have the program for US PASSPORT SPECS. The measurements required for each country are different. Many stored say “oh yes, no problem” and when they hand you the pics, they are the wrong size. I took a ruler in my purse and the girl was rather annoyed when she had to get a manager to show her how to set the measurement to US SPEC in a drop down box and they needed to reprint them. Mail package: I mailed in the designated DHL envelope with a duplicate DHL return enclosed. I received my new passport in 12 days. CRITICAL!!! TRACK YOUR ENVELOPE AND BE HOME THE DAY OF DELIVERY. Actually, I would wait by the door all day until it’s in your hand. The post lady was unsure which door was mine and gave my envelope to a neighbor and marked in the system “DELIVERED”. I spent 2 days knocking on doors trying to find out who had received the envelope. Post lady didn’t take a name, leave a note in my box, nothing. She just handed it to a random person who happened to be getting their mail at the time. DHL was little help and said they would mark the package as “lost” and whatever it was, I could contact the place it came from and reorder it! AHHHH! They had no care that the envelope was a sensitive document.